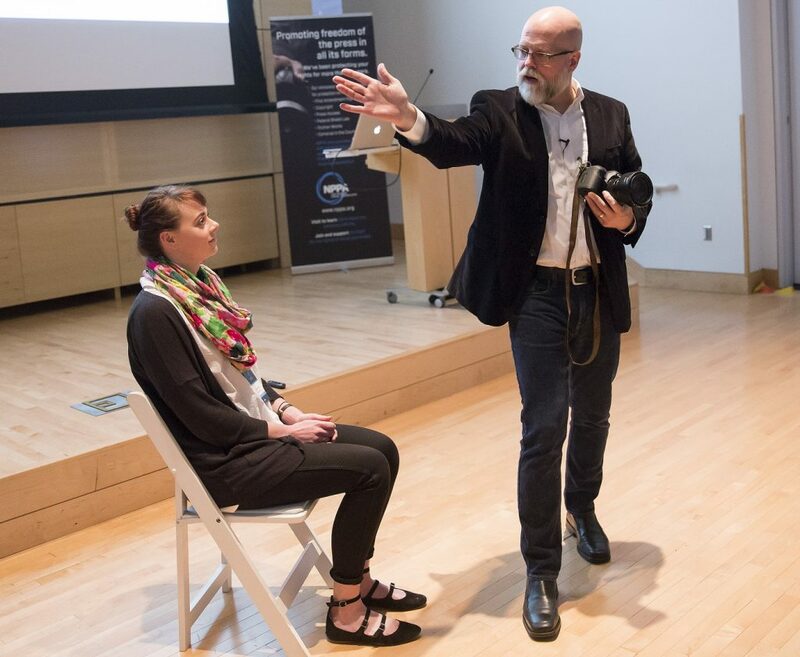 Every year in late spring, after classes end and students have left campus, a whirl of activity descends upon the Newhouse School, where the National Press Photographers Association (NPPA) holds its annual Multimedia Immersion workshop, known affectionately among participants as the MMI. Seth Gitner, an associate professor in newspaper and online journalism, has been involved with the event since its inception. “We’ve been doing this workshop for 11 years and this is the eighth year in Syracuse,” Gitner says. The workshop started as a response to the growing pressure from traditionally print-based media outlets to produce multimedia web content. And so the MMI was born. Every year for five days, a group of about 40 participants, 20 coaches and a handful of instructors gather in the Joyce Hergenhan Auditorium for an immersive experience in multimedia storytelling. In the event’s nascent years, most of the participants were still photographers looking to learn about video and sound. Now, Gitner is seeing an evolution in the makeup of the group. The event starts on a Tuesday with a full slate of sessions led by coaches and Newhouse professors, covering the basics like sound, lighting and interview techniques. And then, the hat comes out. By “it” he means the storytelling. Each participant, with the assistance of a personally assigned coach, must then uncover a story from nothing but a name and phone number on a piece of paper, then produce a complete video telling that story, all by Saturday’s screening. Wednesday and Thursday, participants work with their coaches to delve into their subjects’ lives and experiences and find the story. Then they go out and shoot, testing their new skills in video production. Stories from this year’s group dealt with a variety of subjects, including a day in the life of a bicycle cop, a woman with a terminal illness who makes art from metal and a blowtorch, and a mother whose waking hours are spent caring for her blind and deaf baby girl whose devastating condition remains undiagnosed. For an experienced team of broadcast professionals, stories like these might take a few days to produce. In five days, these participants do it all themselves, one participant telling each story, with a coach available to them for advice and inspiration but not doing any of the work. Danese Kenon G’06, currently the deputy director of photography for video and multimedia at the Tampa Bay Times, returned to Newhouse this year to work as a coach. The participant to coach ratio—one coach for every two participants—is a point of pride that the organizers work hard to maintain. The workshop this year was sold out with several prospective students on a waiting list Those who get in often discover that the MMI changes their perspectives on their work. Loveleen Kang, a documentary filmmaker from Toronto, posted on her Facebook page about being a participant in this year’s event.